Turkish President signs bill that provides the legislative authority to implement the reconciliation agreement between Turkey and Israel. Turkish President Recep Tayyip Erodogan on Wednesday signed a bill that provides the legislative authority to implement the reconciliation agreement between Turkey and Israel, Haaretz reported. Under the deal, Israel will pay Turkey $20 million in compensation for the deaths of 10 pro-Hamas Turkish assailants who attacked Israeli soldiers during a raid on a Gaza-bound Turkish aid ship in 2010. Israeli cabinet ministers approved the deal with Turkey in late June but Ankara did not send it to parliament until last week because of time pressure following the July 15 attempted putsch by a rogue military faction. 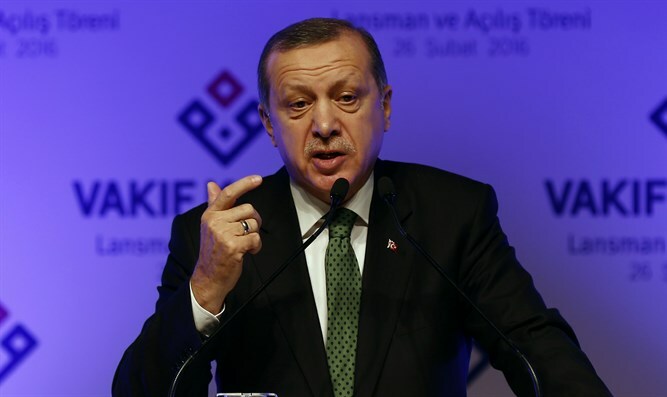 With Erdogan's formal assent, the bill now takes effect. It includes a provision voiding any legal claims brought against members of the Israel Defense Forces and claims that might be brought in the future. Turkey’s Foreign Minister, Mevlut Cavusoglu, said last week that Turkey and Israel would begin the process of swapping ambassadors "in the coming days".